Wholehearted children: “Children who live from the freedom found in being wholeheartedly and unconditionally loved (and liked!) by God in Jesus Christ. Because of God’s extravagant grace, wholehearted children are compelled and empowered to love Jesus and love others as he first loved us. That is the message of this book, and the springboard from which all the parenting advice comes. It is the message of grace. It is the message that we will never be good enough for God, and our children will never meet our expectations. Then there’s grace! 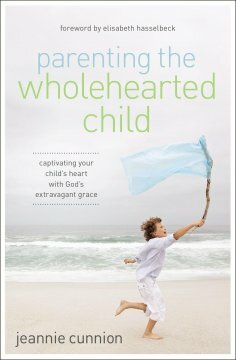 In the first two parts of this book, the author takes you through your personal relationship with Jesus Christ, and how that affects (or should affect) your parenting. She leads you through the thought process of analyzing how amazing God’s grace really is, then helps you get specific in the areas of Bible reading, Scripture memory, public worship and serving others. This first half is designed to get to the root of parenting = who you are as a child of God. In the second half, she gets specific with certain character traits where we want our children to excel. And finally she takes us to the areas of being a good example to your children, and how to discipline and correct while keeping God’s grace in mind. There were chapters that had really good information and advice, but then there would be acrostics, or a little phrase to help you remember the process you should go through to reach the goal of that chapter. That was superfluous to me and seemed cluttered. I could still glean a lot without feeling like I had to follow it to the letter. As a whole, this book was very challenging to me as a mother. It opens doors of understanding, and wraps your child-heart in a arms of overwhelming and everlasting love, as we consider our perfect Father and how He loves His imperfect children.